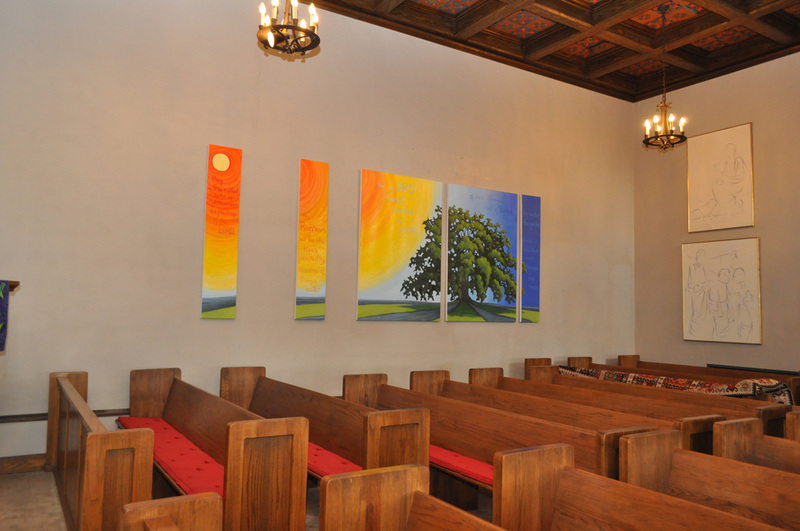 "The Garden" is a five canvas polyptych, painted for the chapel at Idlewild Presbyterian Church as my final large-scale artist-in-residence project. It's six feet high and spread out along the wall of the chapel. The painting is called "The Garden", and is my vision of the promised renewal of creation, with the tree of life at its center and rivers flowing out of it to water the earth. One of the things I love about apocalytpic literature (which I've been thinking more about ever since illustrating the book of Revelation) is that promise of a new creation. Not just human souls are saved, but all of creation is remade into what God intended for all of us. The Bible texts included in the painting read: "They will be called oaks of righteousness, the plantings of the LORD." (Isaiah 61:3). "The righteous shall be like trees planted by streams of living water." (Psalm 1). "The LORD God planted a garden.... A river flowed out of Eden, and there it divided and became four rivers." (Genesis 2:8-10). Below is a 30 second video based on still photos of the hanging of the piece, taken every minute. Frank Kelly, Idlewild's director of youth ministry, took the photos and created the video from them. The photo at the top is also Frank's.